We strongly believe that the best available technology to remove chemicals and VOCs is activated carbon. To learn more about activated carbon, click here. 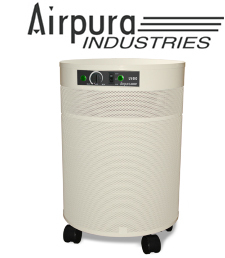 While almost all of our Austin Air and Airpura air purifiers contain activated carbon filters, certain models are definitely better suited to chemical and VOC removal. The greatest factor in chemical removal effectiveness is the volume of activated carbon present in the filter. Furthermore, certain models contain specially impregnated carbon to assist in the reduction of certain chemical contaminants. Of course, consideration should also be given to your budget, the size of the room you wish to treat (air processing rate), the removal of other contaminants, and filter life. Our top choices are the Airpura C600 and Airpura V600. Designed specifically to remove harmful chemicals and VOCs, the Airpura C600 and V600 feature large activated carbon filters. A HEPA-grade post filter removes airborne particulate matter. Both have an excellent air handling rate of 560 cubic feet per minute which results in faster air turnover. The Austin Healthmate HM400+ also preforms very well and is available at a very economical price for those on a tighter budget. If ammonia or formaldehyde are specific contaminants of concern, the Airpura V600 or Austin Healthmate Plus (with Superblend) models would be the best choices due to their specially impregnated carbon filters. The HM200+ and HM400+ are identical other than air handling rate. Accordingly, the HM200+ is designed for smaller rooms.